Some time ago Daily Blog Tips had guest post on network integrity monitoring. While I am acquainted with concept I didn’t really get what subtly mentioned by post author tool was about. So I went and registered to try that Sucuri Network-based Integrity Monitoring. 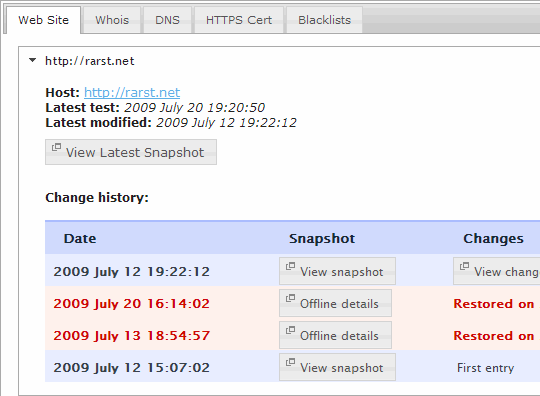 presence in blacklists (such as Google Safe Browsing and more). Effectively it acts as both uptime monitor and security measure for fast alarm if site and/or domain get hacked. I did not like page content scan much. It reacted to tiny changes in sidebar, such as number of Twitter followers so I just disabled it. Adding additional domains is quite confusing. Actually I had only figured it out while writing this post. Initial domain gets added into all checks at the same time, but more domains must be added into each category separately. In my opinion NBIM is basic uptime monitor with good security features. Since it is also completely free and easy to use it adds up to quite compelling service that is probably useless daily but might save your day and site at some time.